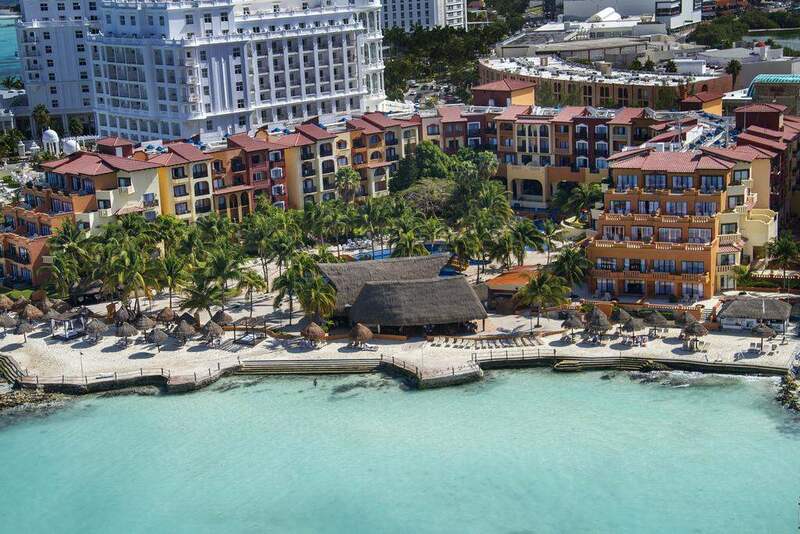 This hotel has an amazing beachfront location on Cancún's La Isla. 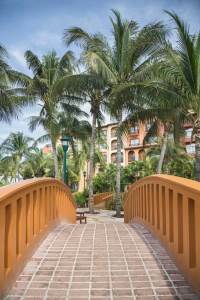 The hotel offers a spa and on-site dining at the Palapa Restaurant. The guest suites include a kitchenette and a balcony. 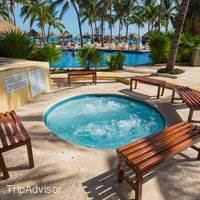 Fiesta Americana Villas Cancun features an outdoor pool and a fitness center. 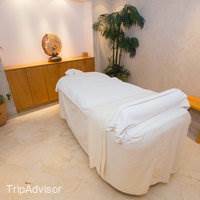 A spa is located at the hotel and offers body treatments and massages. 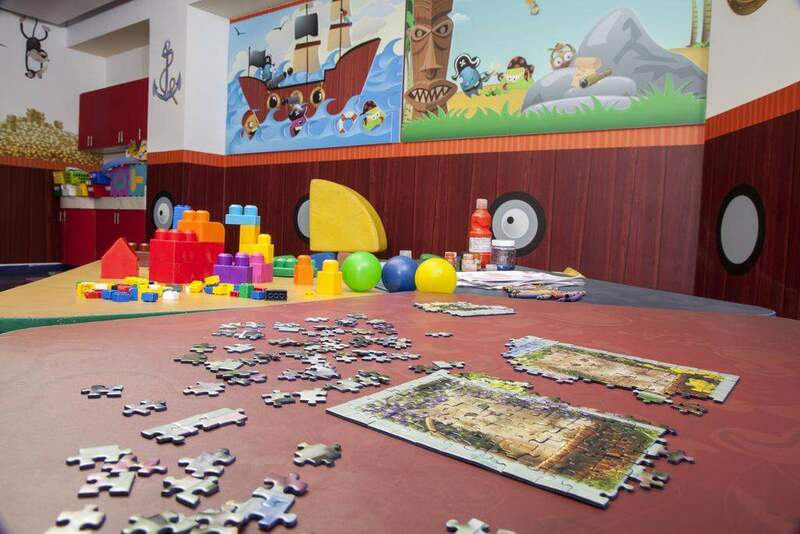 The hotel also offers an on-site gift shop and supervised children’s activities. 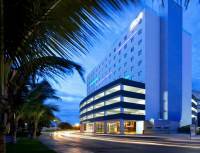 Downtown Cancun is a short drive from the Villas Cancun Fiesta Americana. 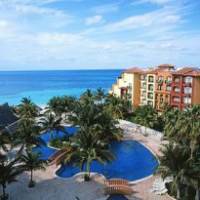 Cancun International Airport is a 25 minute drive away. Only superlatives can best describe our stsy here. The beach, the food, the personnel all outstanding. Topping everything was the entertainment provided by Sergio Guadiana. 5 stars for him. My entire family wanted to adopt him. 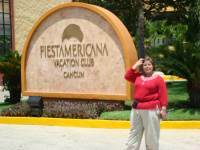 I just returned from a week at the Fiesta Americana Villas Cancún. The one bedroom suite was great, kitchen, stove (no oven), coffee maker and a blender. The DVD player will not read US discs. The staff is great whether you are on the beach or by the pool there is always staff close to get you anything you need; food, drinks, towel, sunscreen. The concierge service is superb. 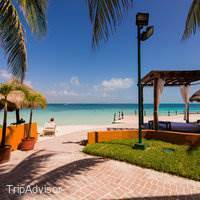 Ignacio was awesome, he knows all the best places and is very knowledgeable. He was always there when I had even dumb questions, I’m not sure he ever goes home. 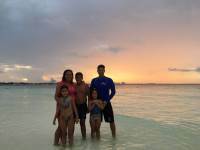 Best vacation I have ever had, I am going back as soon as I can, exciting, adventures, relaxation, and all the comforts of home.Thank you to Ignacio and the entire staff, they made the difference!!! I was pleasantly surprised at this hotel. Knowing it was a timeshare hotel I expected high pressure sales people. And I did but they are very skilled and I was interested in their presentation. I did however thoroughly enjoy my stay here. The grounds are very nice but there are a few updates that the hotel could stand to undergo. Overall the location cannot be beat for the price. The beach is nice and the pool area is nice as well. Overall I recommend this hotel. The staff was extremely helpful and nice as well!! Thanks! Great Hotel and Great Staff. 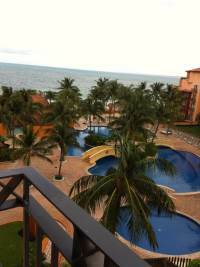 The rooms are very nice, we had a two bedroom with balconies overlooking the Gulf. The staff was very accommodating and anxious to serve. Special Thanks to Bellman Javier who welcomed us warmly and gave us directions and suggestions to help enjoy the area! Stayed here for 5 days with friends. 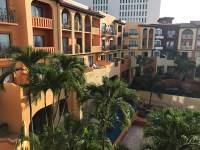 It has a very Mexican feel unlike the other big chain resorts. Beds were comfortable and room was clean. WiFi was surprisingly good by Mexico standards. We had small balcony with partial ocean view. This is a timeshare that appears to offer hotel rooms as well. They will hound you for a timeshare presentation; we kept saying no and continued walking by. Very fair price we paid per night. All staff were friendly. A/C worked plenty good. Location near main drag of restaurants, great supermarket, bus routes, clubs, etc... Beach in front was enough for us and mellow. 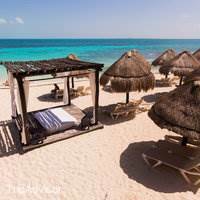 Always had a palapa and chairs and beach towels. Granted we were there for slow season. 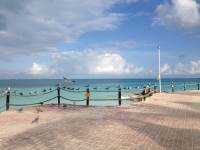 Went to Isla Mujeres, ferry is within walking distance. Not luxurious but clean, comfortable, safe and adequate. Family feel, not a lot of young partiers running around. 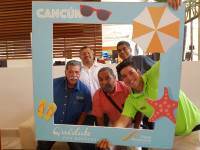 Our second trip to Cancun this year saw us return to Fiesta Americana Villas Cancun. The weather is mixed with clouds, sun, and some rain, but overall very pleasant. 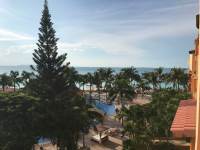 Major changes are underway at the hotel, the beachfront restaurant La Palapa is under a major renovation, the lobby and main entrance is also scheduled for a total re-do. In spite of the work, there is no real inconvenience and any noise or construction litter is an absolute minimum.The restaurant has split into two, one small location next to the pool, and a main location indoors off the main lobby. We have had 2 fabulous meals so far (more on that later) and the Sunday Brunch spread was spectacular. The chef, a very talented young man, has revised the menu since March '17 and the new fare is a full cut above the old. Our first dinner was composed of a ceviche appetizer followed by Fruti de Mar, a seafood pizza of which I have never seen (or tasted) it's equal.Yesterday was the piece de resistance, we had gone fishing earlier in the day and brought the chef a couple of barracuda fillets, and 3 decent sized fish the locals call 'mujeres'. I gave them over and suggested the chef do with them as he saw fit, and so he did! Our first course was finger-cut cuda ceviche, and a plate of what looked to be cured cuda cut and served like carpaccio topped with fresh veggie bits and dabs of tangy sauces. The main course was the mujeres, served whole, cut to the bone on a diagonal and deep fried without batter. 3 unique and delicious sauces were included as was a plate of traditional beans and rices including more fresh veggies gently seared. I was dumbfounded by the dish. Also, the presentation was spectacular! We finished the feast with an absolutely delightful Mexican cheesecake covered with a fresh strawberry compote. We topped it all off with a cappuccino poolside. This review is not complete without a major kudo to our waiter Rolando who served us in old world style, elegance with attention to detail. The entire service staff at the restaurant worked flawlessly to make our evening truly a most memorable occasion. We had a great time! Live Dj by the pool area, karaoke, games, etc. Our beach shore was so clean and calm. All staff were so friendly! No one person gave us a hard time. Gustavo and Sergio became our friends! Great hospitality. Thank you guys! Los voy a extrañar! The nightclubs and markets are so close. About a 10 min walk. I would highly recommend this hotel. I would be coming here on my next trip! 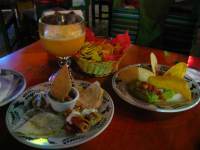 Every Tuesday they have social hour, free drinks and appetizer! Gracias Chicos! Stayed here for one night only fantastic location and accommodation. Had a room upgrade to one bedroom apartment which had amazing sea and pool view and lots of amenities including microwave. Bed was very very very comfortable. Thank you very much Jose on the reception desk for all your help and information in the area. Hotel was very clean and fresh looking as it is having a few renovations and a fresh lick of paint but nothing major to put you off. Would recommend this to anybody looking for self catering accommodation in the area. Had a great chance to get away and relax. Enjoyed the clear water and sandy beaches. Loved the people We had great weather. Hotel will be even better once all the renovations are complete. We would recommend to friends. Activities in Cancun Bay were a blast. I booked and paid for this hotel through Agoda. But lo and behold, I arrived in the hotel and was told that they didn't have my reservation. Ignacio in the concierge was very helpful and helped me sort it out within an hour or so. But I was told that this is not the first time and it has been a constant thing with bookings with Agoda. They have a central booking system that doesn't get updated with the Agoda bookings. The hotel should sort this out soon because it's really a disappointment to start a supposed to be relaxing holiday that way. 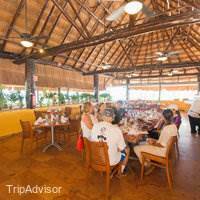 Outstanding customer service at the Palapa Restaurant inside the hotel. The following members did an amazing job in taking care of us:Rolando, Gerson, Maria-Clara, Lupillo, Osiris, Rolando, Pedro y Gaudencio. We give them 5-Star class in customer service. Our trip was from Sep 4 -12. Thanks so much.Jose A. My first impressions were great. 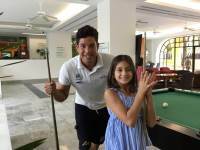 The hotel was very clean and the staff was really friendly especially Sergio, Gustavo and Roberto. Thanks to them all we had a really great stay. 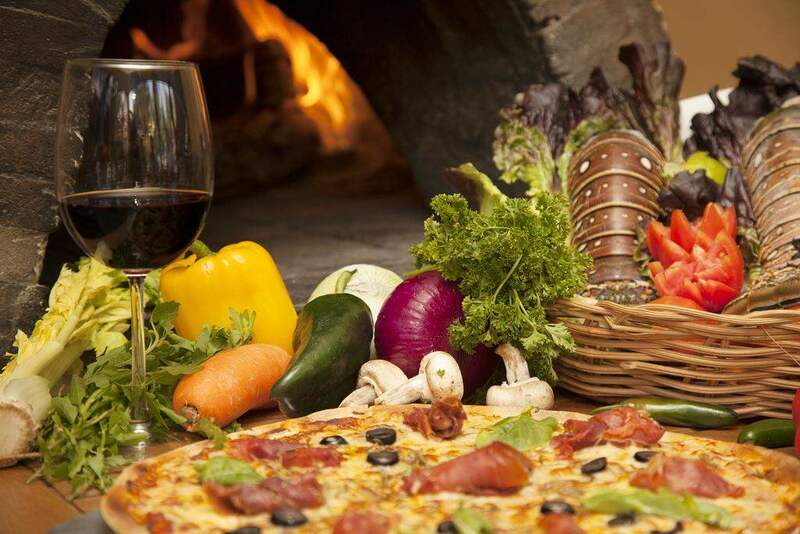 The restaurant has good food and not so expensive. I also like the small beach area and the blue water. It was really great ! 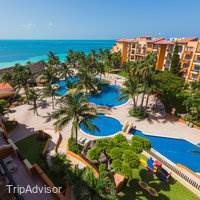 Our recent visit to the Fiesta American Villas in Cancun has turned out to be just as enjoyable as the 6 previous times we vacationed there. All 5 of our family members, ranging in age from 6 to 67, were pleased with and appreciative of the incredible hospitality shown to us by all the members of the hotel staff. A special thank you to chief concierge Ignacio for making impeccable transportation arrangements for complicated round-trip transfers to and from the airport and hotel for our family members and also thanks to Vania for exceptional customer service.The hotel rooms were spacious and clean, and the beds were very comfortable. 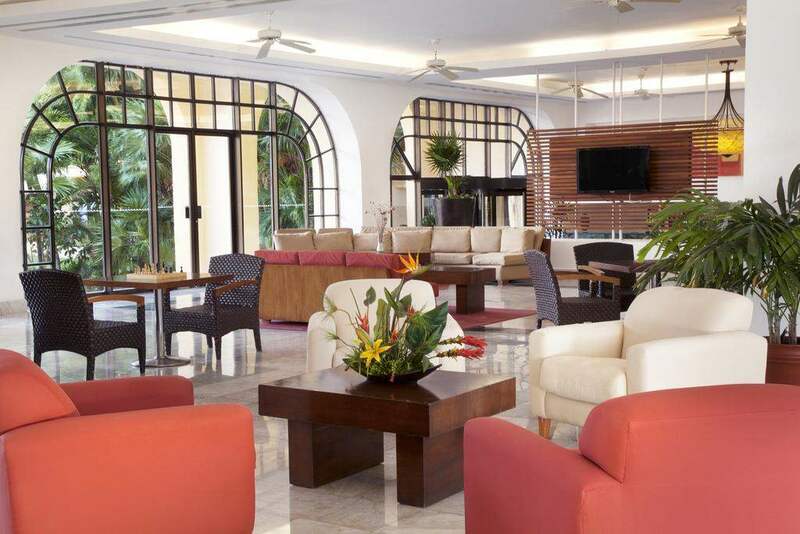 The resort itself is located within walking distance of local restaurants and shops. 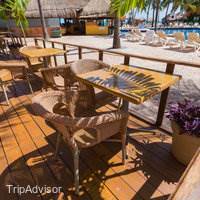 Although the palapa restaurant (which also houses the poolside bar) is currently undergoing a renovation, the poolside restaurant and the in house restaurant were operating and served delicious breakfast and dinner entrees. 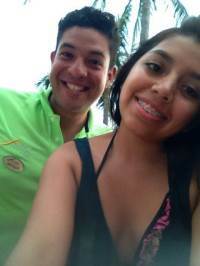 The waiters poolside and ocean side were always ready with quick service and a friendly smile. 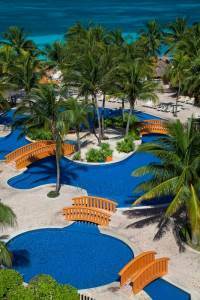 The swimming pool is clean and well maintained and the ocean water of the beaches is clear and beautiful. 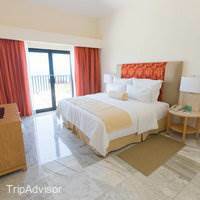 We highly recommend this resort as an excellent tropical vacation destination. Unplug your phone once you get there! This place is not bad overall but the reason why I give it one star is because they deceived me and pretty sure they do with other guest. 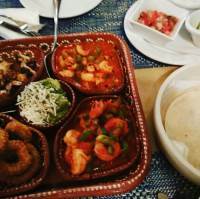 They call and say you have 1000 complimentary pesos at the restaurant, you get down to the restaurant they take your order and serve you and pretend to know what ur talking about until they bring u the check and send u to front desk and then front desk doesn't know what ur talking about so guess what? U have no complimentary nothing save yourself the trouble and disconnect your phone you will receive several of these calls. This place is the worst place I have ever stayed. The service in the restaurant was awful, waited 45 minutes for our meal, then they forgot part of the meal and we finally said, please take it off the check. Then later that afternoon my ring was taken from our room while we were at the beach below our room. We reported it, they searched everything even our clothes, suitcases, purse, etc. still no ring. Since this they have done nothing and its word against there's that I even had it with me. What do I have to gain to report my engagement ring, which I've had for 39 years, missing??? I get no kick out of reporting this. They say there is nothing they can do about it and have chosen to do nothing, as they say we have no proof I had it with me and I asked how do you have proof I didn't? I am very sad to walk away with no ring, unappreciated and disrespected, as they are calling me a liar. Totally disappointed with the Director Manuel. He has no respect for his customers. Our stay was for 7 days, however after the 3rd we checked out, I'm sorry I refuse to stay in a place that calls me a liar and has invaded my privacy. We were warmly greeted when my family and I arrived. It was our anniversary. 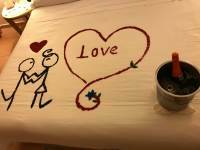 Check-in was very smooth and when we went to our villa, the bed was decorated with "Happy Anniversary" and animated characters which was hand made by talented staff member. Also later that evening, they delivered a bottle of champagne and chocolate dipped strawberries. 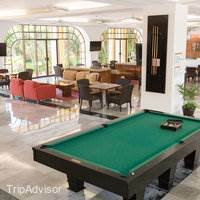 The resort is very nice and the customer service is excellent. 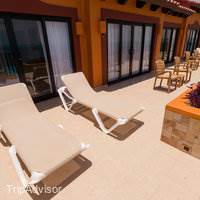 The resort is centrally located to shops, excursions, grocery stores etc. 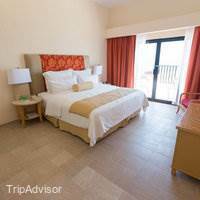 Every room in the resort faces the beach and ocean. This resort is a great place for family, couples, etc. Still Our Favorite. 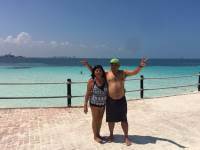 . .
After three years, we decided to go back to Cancun and stay at this hotel because we enjoyed it very much the first time. The new manager and his team have made some great improvements and this is evident right from checking in to checking out.The only downside was that the main restaurant and the pool bar were under renovations but the service and food quality were still amazing.The rooms looked better than the last time! The housekeeping ladies and men were very palate and friendly. 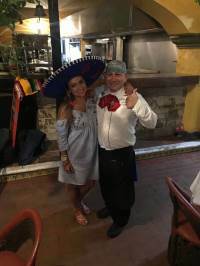 The same can be applied to all staff, restaurants, bar, pool areas, front desk, etc.Every time that we went to the restaurant used in lieu of Las Palapas restaurant, we were greeted with a smile and taken to our table. The breakfast was buffet style but if preferred you could order a la cart or just have the Continental Breakfast. The menus were somehow limited but very good, tasty, and reasonably priced. The service always excellent.The main thing about this place is that the staff makes you feel welcomed and they are always there and ask you if there is anything else that you need so regardless of which area you are at, you feel at ease and this makes your stay and vacation much more enjoyable.We have decided that our next year family vacation is going to be at Fiesta Americana Villas Cancun. This time we'll stay two weeks instead of only one.It is very important to mention that we always travel as a family. Sometimes we are 9, sometimes 8, sometimes 7 and sometimes 4. This time we were 7 adults and one child. My mother in law is 89, my sister in law is 60, my wife is 66, my oldest son is 40, my youngest is 38, his wife is 32, their child is 2 and I am 70. So you can see how varied our need could be and how hard it might be to comply with all our need however at this place, everything ran smooth. Clean, nice friendly staff and good value for money. Because of the large selection at breakfast, lunch was not required! Close to the bars and nightlife but tucked away in a quiet spot. Room service is available and staff check on you in late afternoon making sure you have everything you need for the night. 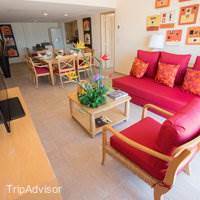 Fiesta American Villas in Cancun is a small, friendly place to stay. We love it, and have been going at least once a year for 13 years. We do not like large resorts. If you are looking for a place to rest and relax, good moderately priced meals, and exceptionally helpful staff, this is the place for you. If you are looking for a fancy resort with al kinds of amenities, this is not for you. NO SPA. NO BIKINI BAR. NO RESTAURANT ON THE BEACH. NO GYMWe were disappointed the minute we walked in the door. What used to be one of the best spas/gyms in Mexico was gone. We found out upon checking in, that they placed a few cardio machines in room 123. We are here for seven days. We've been here approximately ten times before, and knew the service, rooms, and staff were an AMAZING "10". Got up the next morning for the amazing breakfast, and learned the restaurant on the beach, was closed down as well. They had moved it off the lobby in front. No Oceanside dining. No Bikini bar in the pool. No big deal as we don't drink much, but it's appealing and handy for beverages. If these things are important to your vacation, you may be disappointed. If your not interested in an all-inclusive mega resort experience than this is for you. We love the intimacy this property provides and will return again. We walked across the street and found THE BAMBOO SALON AND SPA. The prices were half the price of what we have become accustomed to paying. 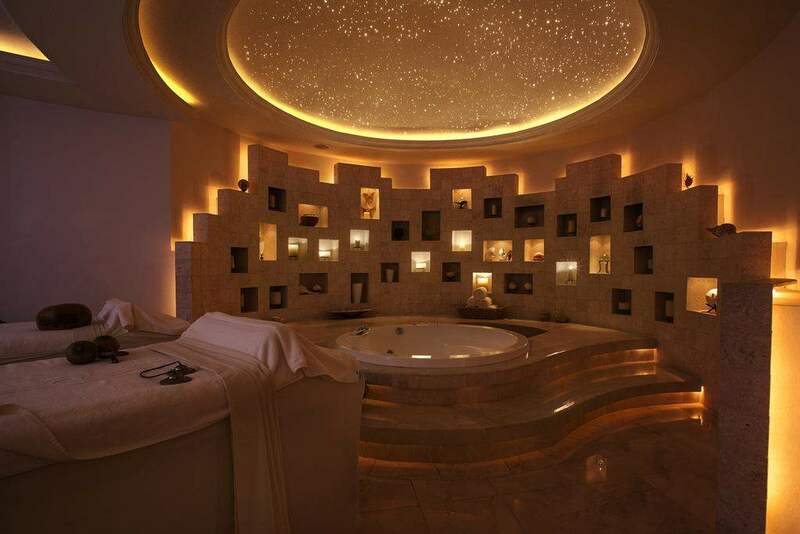 Hands down one of the best deep cleansing facials and full body massages ever. Not including tip around $100 for both. Seriously. So we went about four times. Mani and Pedi's too. I recommend the resort scrap the spa, and keep a gym. Direct people across the street for the Bamboo spa. Focus on what they do best. Outstanding rooms with amazing staff and service. Open the dining area again, for that dining ambience we all love. They already have the best location. Don't be afraid to go downtown towards WalMart. It has one the nicest malls built in Mexico and filling up with shops fast. Who doesn't like H&M? Get out of the Hotel Zone. Your missing out. 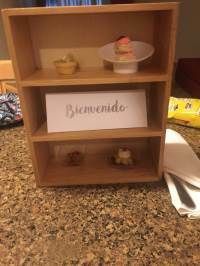 The service in the hotel was great. The staff here was fully attentive to our needs. This hotel is great for a good time. As far as the night life, this hotel if more of a family style hotel so we spent most of our nights in the clubs.. which is when Sergio came in to hook us up. Sergio, in charged of entertainment, hooked us up with good promotions for the clubs in the strip. I highly recommend buying your wrist bands in the hotel. It might be a few dollars more but the service is excellent. With the wristband, you get bottle service, food voucher for selected clubs, a taxi to the club, you avoid those long lines, and Sergio even partied with us... I mean, how cool is that? Thumbs up for the service here! 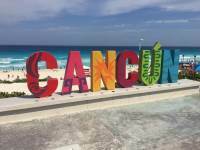 Best first trip to Cancun ever!! My buddy and I came to Cancun with high expectations and Fiesta America did not disappoint! Staff was friendly and very agreeable. It was quickly apparent by their attentiveness they strive to make your stay the most enjoyable. Since it was our first time here we wanted to find out what was poppin! Walking to the pool we came across Sergio at the entertainment center and he quickly gave us the 411 on the best nightlife. He set us up with open bar and cover tickets for a fair price (ranges from 30$ - 80$) we went with Mandala Beach Tuesday night. He promised a great night and delivered! The package set us up with other guests at the hotel and Sergio came along to make sure everything went smooth! Night was awesome and my buddy and I definitely had a blasts with the drinks, bottles and ladies in the club. Just a glimpse of our awesome experience with Fiesta America and we will definitely be coming back! 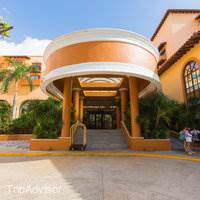 We really enjoyed our stay at Fiesta Americana. At the time we were traveling with a two year old. The staff there went out of their way to make sure he had everything a little guy could need or want. There was a bite of confusion about our reservation but it was worked out. The front desk staff was very apologetic and give us a free breakfast for the six of us. It was a little disappoint to find once we got there the swim up bar and outdoor restaurant was closed. It would have been nice to know ahead of time. The Spa was also being renovated but we were able to go to their sister hotel for SPA service. The SPA there was very nice. The good side of this is that means they are always upgrading to keep the place nice. They were also painting areas but they were not closed. It's a small resort compared to most of the others but I think that gives it charm. They were not so large it was impersonal. Pool is great. We were there at the end of August and the pool was empty. I do recommend this especially if traveling with a young child. 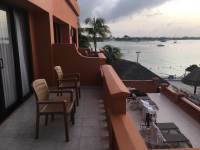 Located in a beautiful harbor, the hotel fits very much for families and large group of people. Rooms/apartments with individual terrace, kitchen and lot of space available. The staff was polite, always available and smiling! The beach is amazing by the colors of the sea and the sand: great chance to have a long walk along the sea for miles. 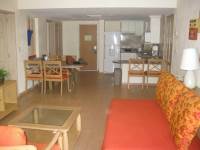 Clean, well furnished in the center of Cancun with an extremely convenient ratio costo/benefit. Very much suggested. We were at the hotel for only one night but everything was very satisfactory: reception, information, suggestions, suite...We were upgraded to a suite since our reservation requests were not available. The meal and service at the hotel restaurant was excellent and well presented. All in all a good stay. very well run property staff friendly & helpful. Rooms very well appointed. only complaint was NO USA TV CHANNELS. with a high % of USA travelers it would be a good idea to add FOX NEWS forgewt FAKE NEWS CNN ...Also add the weather Channel.....Wi-Fi spotty in certain rooms BETTER in others. Cell Phone signals ok throughout property. POOL very nice Beach Great! 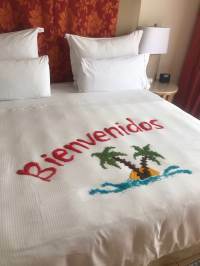 Our experience with one night stay at Fiesta Americana Villas in Cancun with family was definitively below our expectations and overpriced vs overall hotel appearance, quality of room and services. Food was also not at required level. This property was a wonderful surprise for our family. Every person working there was cheerful, helpful and all around knowledgeable. We are a beach/water loving bunch and this resort was on a beautiful stretch of sand and sea. Safe enough to swim at night! The restaurant and drinks were very reasonable. The rooms, kitchens and beds were clean and comfy. 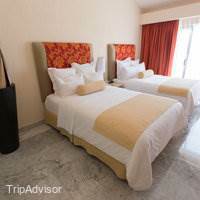 It was nice to be located between the nightlife scene and Cancun town-quiet and cozy property. We've been to a number of such properties in Mexico and beyond...this was a little gem. 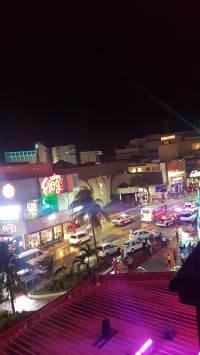 It was the best days I spent at this hotel, all very attentive and helpful the rooms are comfortable and the best I could spend my beers .. if you visit Cancun I recommend this hotel close to the clubs. We thoroughly enjoyed this property...staff, beach, food and rooms were terrific. 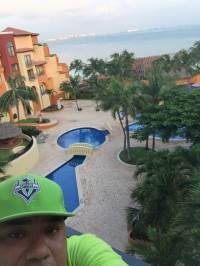 We've been to other properties in Mexico and beyond, and have nothing but good to say about being at the Villas. Our beach/water loving family found beautiful, safe shoreline to swim (even at night). Prices for food/drink are reasonable. Kitchen and rooms were wonderful. Staff were friendly and accommodating. 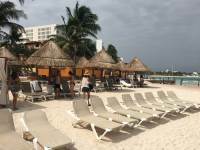 Loved the coziness of this place and it's perfect location between downtown Cancun and the hotel zone activities. For Cancun standards, this is a small hotel. It is not an all inclusive. 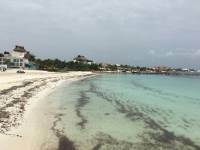 It is very well located close to the night life heart of Cancun and close to the pier that takes you to Isla Mujeres. We travel with several family members so we got assigned connecting rooms with a great configuration. 1 King, 2 queen and a sofa. Rooms are very well maintained and spacious except for the bathroom that is very small. Service is great across the hotel, except at the restaurant which it takes too long for food to arrive; although food is great. There is only one restaurant. Another thing to consider is that there is a lack of shades at the pool. Only a handful of spots have shades through the trees. 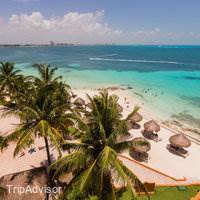 There is free Wi Fi across the hotel, although not great speed, it works OK. Beach area is very small and doesn't seem is maintained as good as some of the neighboring hotelsIn general, is a good option for Cancun especially if location is important for night life. 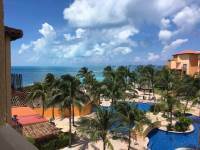 We were hesitant about our vacation at Fiesta Americana Villas in Cancun. There were not very many detailed reviews about what to expect. We were pleasantly surprised. 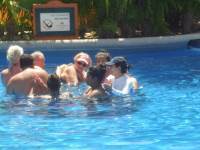 Although we booked activities around Cancun, I would have been happy hanging out at the resort most days too. The pool area is nice and the kids enjoyed it. Their only complaint is that it wasn't very deep in any area. 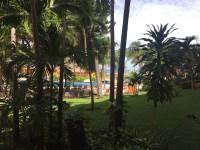 They were able to play basketball and volleyball in the pool, as well as being able to play darts and various games in the pool area.The beach area is not massive, but it was enough for us. They have chairs and some shade. I'm not one for just laying around, so I was happy that the snorkeling off the beach was great. We saw barracuda, a huge stingray (3' diameter), moray eel, lobsters, starfish, and many fish. The rooms are nice, beds were comfortable. We stayed in a 2 bedroom suite. I will say the couch bed is not much of a couch. If you try to sit on it, it slides as soon as you lean back. We didn't hang out much in the room during the week, so this wasn't an issue. We did wish it had an oven, but made it work with the stove and microwave.We enjoyed the bar and restaurant. The prices weren't too bad and I thought the drinks were very reasonable. Food was good at the restaurant. The chef even cooked up the fish we caught and served it with vegetables and rice. We were impressed.The biggest complaint I have is the elevator. It doesn't ding when it arrives, so I got distracted while waiting and missed it a few times. :) The internet connection is not the greatest, but we made it work. For the work we had to do, we had to go to their business area and use their computer. Otherwise, it worked enough for our vacation needs.The concierge services were great. 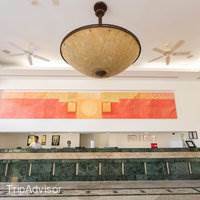 They were very helpful and really were an asset for us during our stay. We also used the concierge to help book cheaper activities like parasailing, which we got to right off the beach. The bellmen were equally as helpful. 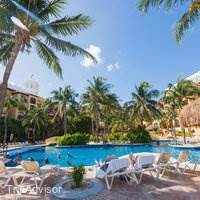 Everyone was pleasant and seemed extremely willing to help in any way.We would return to Fiesta Americana Villas anytime! Had a great time at this hotel. Staff is very friendly. The restaurant has good food, the hostess Orsais and waiter Luis were always very nice and ready to serve us. Hotel is on the beach, rooms are big and comfy. Very clean. Onsite restrooms and amenities are very well kept and clean at all times. We would definitely stay at this hotel with our family. The good stuff: (4 out of 5)- super clean- walking on the beach before 8am is wonderful- great sunset views- staff is great- food is delicious- the little beach is nice- Rooms were HUGE - AC worked great!- big new flat screen TVs in rooms- Breakfast buffet is awesome!- food quality is high...- close to shopping center- pool is nice and cleanThe average stuff: (3 out of 5)- Cup of coffee outside of room costs $- WIFI is DREADFUL!- drink costs are $$$ (go to store and get your own)- beach is tiny- some lobby furniture is broken- no organized activities for guests by pool or beach- jet skis everywhere starting around 10am- no inclusive optionWe enjoyed our stay and the timeshare location was very nice. Some of these average items of addressed would make this a solid 4 or even a 5 rating. The biggest complaint though was the wifi. Strong signal but never a reliable connection everywhere but lobby. Just stayed here last week husband and 2 teenagers. We really enjoyed it. It's a smaller property than some of the huge ones - no nightclub- so it was nice and relaxed. We got a hotel on the Riu hotel side. View was amazing. Others noted noisy night club which we did hear but not too late and not very much once inside. Our room was just a few floors down to the pool. There were plenty of chairs by the pool and covered ones by the beach. We really enjoyed the pool (nice and warm) and especially the swim up bar. There's a volleyball net and basketball hoop but we found the users to be respectful. Lovely large beach towels available too. Loved the beach. Others noted not a ton of sandy "dry" beach but the water was very warm and nice and sandy to swim. A few reefs right off the beach too for snorkeling. Wave runners and parasail right next door. Seas were a little rougher 2 days but when the weather was good it was great swimming. We are at the restaurant a few times - never for breakfast. Dinners were good and reasonably priced and the view right on the beach can't be beat. Just one open air restaurant (and I guess a little pizza place). We had a 1 BR suite which was nice size. Well appointed kitchen and full size fridge and microwave. 2 nice sized flat screen tvs( got about 6 English speaking stations) not sure what you get at other hotels. Safe in room was good size and worked. Our bedroom had 2 doors to close (bedroom and to the bath) so you could have private from the other room. Bathroom was large (separate closed door for toilet) with tile floors. Tub was nice and large. Shower water pressure was fine. Our king was a good mattress. The fold out was a bit odd (see some other comments) more like 2 mattresses than a sleeper sofa. Our kids fit ok but 2 adults might have had more of a challenge. It was not a queen. Barely a full. Everything worked and was clean. Location was great. Short walk to an amazing grocery store and easy bus access and other shops and restaurants. Easy bus access up and down Zona Hotelera. Thought this was a good price point for the property and location. If you are looking for lap of luxury this isn't the place - but you'll pay for it. No night club and no "activities" so if you are looking for that I'd pick another place. It's quiet and older in the colorful Mexican style. Only negatives were some construction while we were there we were not told about at booking. Lots of rooms we saw being done and even some right down the hall (little paint smell in the hallway but not too bad) except for one afternoon when they were using a jack hammer - yes an actual jack hammer in the room right next to us. It literally sounded as if they were in our unit. Very very loud and not acceptable. We had been out all day so not sure how long it had been going on. I had to call the desk 3 times and get transferred multiple times and always told "a few more minutes" and as I was going down to complain in person a staff person went by and I stopped her. Took about an hour to stop which was not cool. The scary part was the staff person could not promise it wouldn't resume the next day - and basically offered a cabana as compensation. It ended up being a rainy day so that would not have helped. Luckily there was no more jack hammers but we worried about it all the next day. If I came back I would ask first because I'm not sure in what degree of completeness renovations are. We chose this over the JW Marriott bc they posted on their website they were doing renovations. The other negative is this is a vacation club. They were relentless in trying to get us listen to their spiel at a breakfast. Accosted us at the check in process (2 separate people) and we felt we had to almost forcibly remove ourselves to go to our room. They called 3 more times on the phone to ask if we'd do it as well. We avoided the "free" happy hour and the concierge all week bc we didn't feel like dealing with it. Way too pushy with the sales. Others noted helpful staff - we didn't have really any special interaction good or bad. Everyone wants a tip but we found that everywhere in Cancun. Would we stay here again if we came back? Yes probably - overall a good value and great location although we wonder if it will get swallowed up by a newer larger hotel. Would definitely be clear about construction first although not sure you'd get an answer you could rely on. We had a phenomenal experience every time we had dinner at Rosato (a total of 4 times). The waiters were very attentive and made sure to customize my food to prevent an allergic reaction. Our last night at Rosato we had an amazing server, Pablo, who was extremely patient as my family and I practiced our Spanish and made the experience so much more enjoyable. I highly recommend this restaurant and please enjoy sure to say hello to Pablo. This is a wonderful resort on the beach with a great pool and beautiful beach. 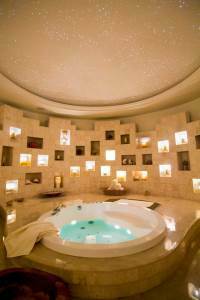 The atmosphere is relaxing and the staff was incredible. They were warm and friendly and very professional. The breakfast staff was especially nice and always greeted us by name and knew what we wanted to order. The best of all was Luis! He treated us like we were long time friends and Pedro, Gaudencio, Rafaela and Fernando were also so friendly and helpful. We also really appreciated how helpful Fabian and Roderigo were. They always greeted us with friendly smiles. Ignacio also helped us find a wonderful restaurant fro our last night which we really enjoyed. I would definitely visit here again! The staff is the best. Everyone goes out of the way to make sure your vacation experience is a wonderful one. We would like to specifically recognize Ignacio, Paulino, Sylvia, and Rafaela. 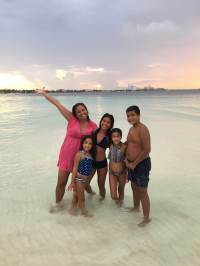 This was our second stay at Fiesta Americanas Villas, Cancun, and we are already planning another visit next year, bringing more family members with us. Excellent Location, I loved everything about this Resort from the beginning to the end of the trip... I was there with 6 other friends it was my Birthday Trip and they made everyday a special one! the rooms where clean everyday, I would stay here again.. All the Staff made us feel so welcome. The Breakfast buffet was delish and at a good price.. I would rate this a 5 or more! 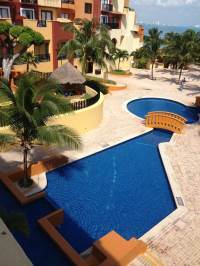 It was a great location close to clubs and the Mercaditos.